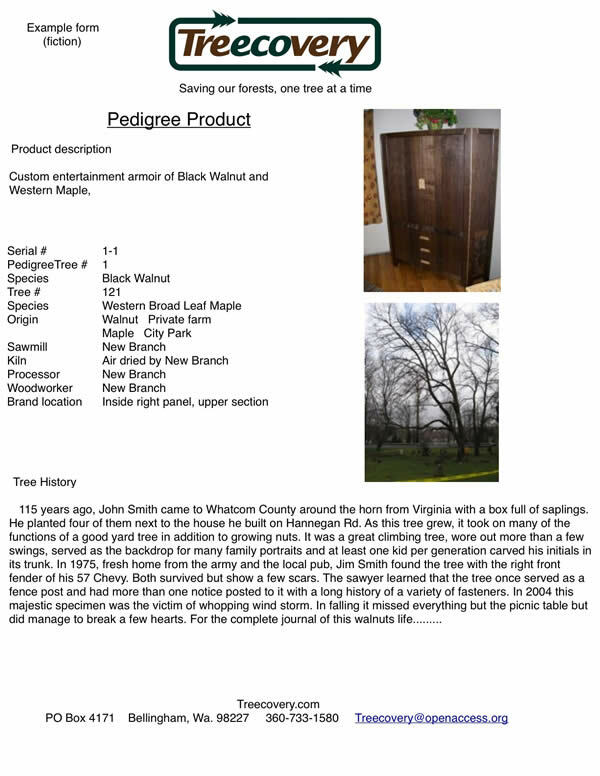 Pedigree trees are the “cream of the crop. Every now and then a really special tree comes along. Maybe it’s the cherry tree George Washington didn’t cut down, or the walnut great-great grandad planted that has the initials of multiple generations carved in the trunk. The stories these trees could tell! We would love to give these trees the respect they deserve, share the story, and add value to products made from them. Se we have developed a program that documents the whole story and carries it forward. Every product built from these trees will be branded by Treecovery member woodworkers and listed by serial number.Buyers of these products will receive a document describing the history of the tree, how it met its demise, who milled it, processed it, and built the end product. We will store this information in perpetuity for collectors and heirs. If you become a woodworker member of our pedigree program you will receive a “Treecovery” brand with your member number and we will track your products indefinitely by serial number. Over time this should offer significant added value to your efforts!